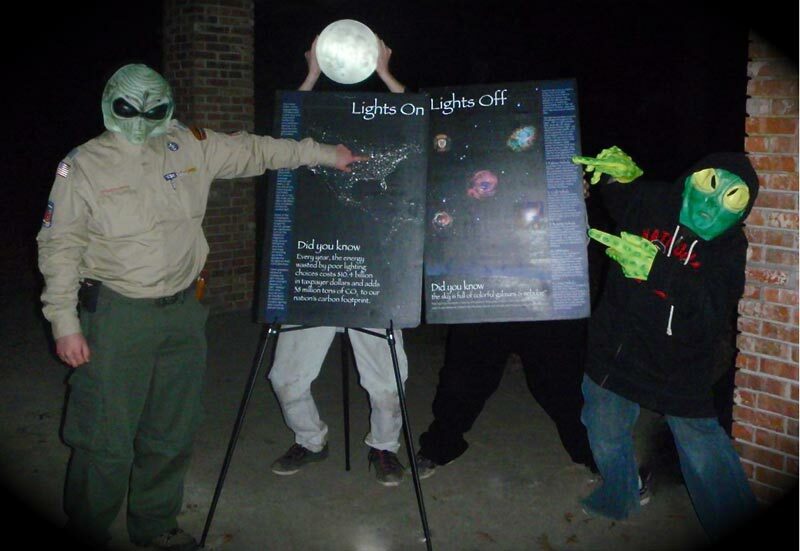 StarParks is a program for Boy and Girl Scouts (of all levels) to invite their peers to join them in raising awareness about light pollution and improving the skies in their community. The main objective is empowerment! Participants will learn they can bring about real change in their community and will establish a dark-sky oasis to view passes of the ISS, meteor showers, stargazing, and telescopic astronomy. The education component is two-fold: participants will learn about light pollution, and then spread awareness through activism. They will learn the basics of what light pollution is, its effects on our environment and health, and how light pollution can be stopped. The will learn to identify “good” and “bad” light fixtures (i.e. fixtures that contribute to light pollution and fixtures that do not). For the advocacy component, students will select a location in their community where they would like to establish a StarPark. The StarPark will be established on public or private property that would become a suitable place to hold StarParties and observing sessions, e.g. a park, a soccer field, forest preserve, etc. Scouts will use their knowledge of light pollution to determine how the location could be made more astronomy-friendly for telescopes, binoculars, and the unaided eye. They would identify “glare bomb” style light fixtures and determine what changes could be made to the lighting to offer better seeing. They will then write a letter and/or petition to local government or the owner of the property as appropriate asking to designate the site as a StarPark and offering their suggestions for improvement. If possible, each StarPark will receive a sign designating it as such. As a supplement, scouts can offer a Good Neighbor Lighting Award, commemorated with a certificate, to businesses that voluntarily take measures to lessen their output of light pollution, e.g. by implementing a lighting curfew, installing properly shaded light fixtures, or retrofitting existing fixtures with a shade. They are encouraged to send out releases to local press about the award, and also about their desire to create a StarPark and the Good Neighbor Lighting Award program. They are also encouraged to send out targeted letters to businesses within their community that they identify as contributing heavily to light pollution, and to seek the involvement of their school, church groups, or parents. Scouts will also participate in the Globe At Night star count to measure light pollution and will have the opportunity to participate in The World At Night’s digital photography contest. Participating, interested scouts will also have access to special privileges and opportunities including StarParties with amateur and professional astronomers with telescopes and some access to remotely-controlled robotic telescopes to photograph their favorite objects in the night sky like the galaxy photo at the top of this page. The telescopes are located in New Mexico and Australia, accessed via Global Rent-a-Scope, and in Israel, through the Bareket Observatory. They also may be interviewed for podcasts about dark sky issues. Scouts will earn a StarParks badge for participation in the program and groups will be awarded with a certificate honoring their efforts. Additionally, the prize of a telescope will be awarded to the group that made the most impact. The StarParks program was designed by StarPals and is currently under consideration for nation-wide adoption by the Boy Scouts of America and will be proposed to the Girl Scouts of the USA.